A straight high-speed shot from Dallas to Grapevine might just afford you the opportunity to get a great offer on the new 2013 Ford Expedition. Packed with leading technologies, amenities and more power than you'll find in competitive rivals, the Expedition is a premier choice for Grapevine and Dallas Ford shoppers. 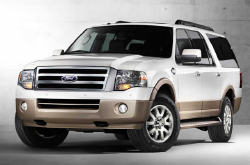 Grapevine Ford carries a large selection of this popular SUV, packed with all of the features and amenities you'll learn more about as you read the 2013 Ford Expedition review beneath the video below. If you like what you learn, be sure to contact Grapevine Ford for additional information and vehicle details. Affordable financing is available on any model, so don't hesitate to let us help craft a plan that fits your unique financial situation. Imagine yourself in a Ford Expedition in Dallas, or maybe cruising the back roads in Grapevine; you look pretty good, right? We think so, too! Read on to see if the Expedition is right for you. Check out the 2013 Ford Expedition to versus similar autos like the 2013 Chevrolet Tahoe, Buick Enclave, Toyota Sequoia and the Dodge Durango, and you will spot that the 2013 Expedition transcends those vehicles in numerous areas. Get a load of the reasons see why! You won't get Ford trained service techs, a extensive warranty on service and genuine Ford parts at a chain auto facility in Grapevine, so visit Grapevine Ford instead. To keep your Ford in staunch working order, put it in the hands of Grapevine Ford's auto repair buffs. Our techs can take on a wide range of jobs - from challenging stuff like Ford muffler repair to less tricky undertakings like battery and tire rotation and replacement. For trustworthy Ford repair in Grapevine, drive your Expedition to Grapevine Ford, where you can count on getting awesome service. Get started on your next appointment by selecting a money-saving service coupon. You can't beat the Expedition's level of refinement, value and affordability, and neither can competitors like the Chevy Suburban or Toyota Sequoia. With a maximum towing capacity of 9,200 pounds, a powerful V8 engine and all of the niceties you'd expect from the Blue Oval, the Expedition proves that some things just get better and better with age. If you're on the hunt for an affordable 2013 Ford Expedition in Dallas or Fort Worth, let the experts at Grapevine Ford set you up with a no-pressure test drive. You can experience all of the power, beauty and grace of the Expedition in person, because ultimately, you won't know you want it until you drive it. Simply call Grapevine Ford and ask to speak with a sales representative or fill out the inquiry form on the right-hand side of your screen. We look forward to seeing the smile on your face when you get behind the wheel of the powerful, yet elegant 2013 Expedition.